The operation principle of the InvariVersum service looks a lot like Shazam but works with video instead of audio. InvariVersum is based on a huge video database and the InvariMatch video comparison technology. For people who have not worked previously with this service, it might seem similar to Google: you scan the video, and the service shows you matches on the whole Internet. In reality, the InvariVersum system can only search for matches among the added videos. Users have to upload the original video to the system and then look for matches. To upload your videos on InvariVersum, you first need to register in one click on https://invariversum.com using your Google account. You don’t need to register if you only want to search in the database. When scanning a video, the system generates a description and provides links to the matching fragments in the database. What can InvariVersum be used for? InvariVersum can be used to prevent unauthorized distribution of video. 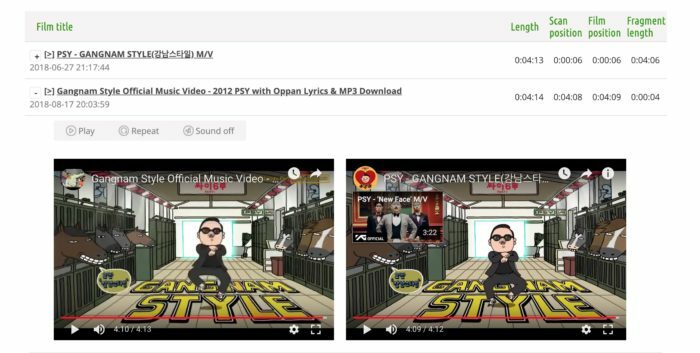 Video bloggers and musicians can upload their content to InvariVersum and search for copies, remixes, and links on the database to protect their video content from piracy and unfair use. InvariVersum can be useful for ordinary people, as well. For example, there are many viral flash mobs and challenges on YouTube. The system allows users to find the author of the original video and find out what was the story behind the video. InvariVersum accepts video files and direct links to popular video hosting services (YouTube, Facebook, Dailymotion, Vimeo). Twenty thousand music videos are already uploaded into the database. InvariVersum searches by only comparing the video at the moment. However, in the future, the team plans to supplement the search algorithm with audio comparing and add a wiki-editor, in which users will write descriptions so that videos can be found using keywords and tags. The InvariVision team will improve and supplement the service according to user feedback. Use the free and minimalistic InvariVersum service both for its intended purpose and to test the InvariVision company’s video recognition technology.